A teacher recently asked us: Do you all have any advice for schools on recess in this incredible heat? It was 112 in Central Oklahoma today. Indoor recess means little or no activity and it's just too hot to play outside for 30 minutes. Are you feeling the heat? With record-breaking temperatures across the United States, it can be hard to fathom venturing outside. But what can parents, teachers, and camp counselors do with fidgety children who still need to play? A few 10-minute dance breaks throughout the day can work wonders for reducing squirminess and increasing concentration. 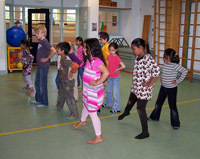 Dancing not only gets the heart pumping but inspires creativity as kids find their own ways to move to the music. Get other ideas for indoor physical activity breaks at Alliance for a Healthier Generation. Turn your living room or classroom into a temporary playground by providing loose parts. Found, donated, or repurposed objects—like fabrics, cardboard boxes, buckets, or sticks, just to name a few—can be manipulated to become almost anything imaginable. Learn more and get inspired at popupadventureplay.org. Get creative! Here is a great idea from preschool daze for a DIY PVC pipe sprinkler. 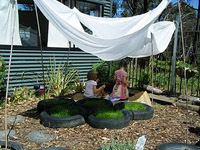 Does your schoolyard or backyard offer any shade? Create some respite from the sun with tarps, tents, and/or fabrics, or use our step-by-step instructions to construct more permanent DIY shade structures. And don't forget about trees, which not only provide shade but also beauty, greenery, and potentially, new climbing opportunities for children! See photos of creative temporary and permanent shade solutions at Let the Children Play. Photo courtesy of Let the Children Play. What advice do you have for beating the summer heat?